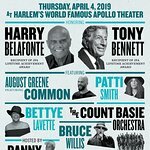 Roscoe Orman, known to millions for his thirty-six years as “Gordon” on the highly acclaimed children’s series Sesame Street, was the event’s MC which honored New York City’s unsung heroes and All Stars Project youth leaders. 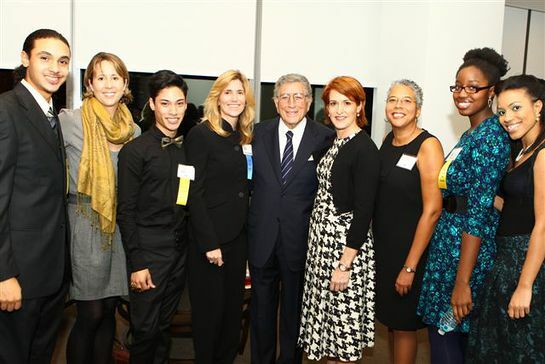 Pictured left to right: Jose-Esteban-Alverio, youth leader; Cheri Walsh, Executive Director, Exploring the Arts; George “Lyric” Pedraza, youth leader; Susan Benedetto, President, Exploring the Arts; Tony Bennett; Gabrielle L, Kurlander, President and CEO, All Stars Project; Pamela A. Lewis, Director of Youth Programs, All Stars Project, Biola Jeje, youth leader and Franceli Chapman, Community Outreach Intern, Office of the President and CEO, All Stars Project. All Stars youth leaders created the Phat Friends award – named after supporter jazz great Phyllis Hyman – to have a civic voice in the life of New York City, so they could tell us which adults and programs are making a meaningful difference in their communities. This year’s Phat Friend Award honorees include David C. Banks, President, The Eagle Academy Foundation; Susan Benedetto, President and Co-founder of Exploring the Arts, Inc.; Dr. Reginald Blake, Associate Professor, New York City College of Technology; Akuah Brabham, African Dance Instructor at Bishop Loughlin High School; Patricia Pates Eaton, Former Principal Conductor of the NYC All City High School Chorus; Michelle Edgar, Founder and Executive Director, Music Unites; Bobby Ferazi, Director of Juvenile Justice and Re-entry Services, PAL, Melissa Fenton Herrod, Former Executive Director of City Light Youth Theatre; Joseph Rivera, Police Officer, NYPD; Marc Sanabria, Detective 2nd Grade, NYPD Juvenile Robbery Intervention Programs and Amy Weinberg, Professor and Deputy Executive Director at the University of Maryland’s Center for Advanced Study of Language. The 2010 Young Leaders for Change awardees are 9 youth leaders – Jube Charles, Biola Jeje, George Pedraza, Jose Esteban Rodriguez-Alverio, Shaun Rodriguez, Nisha Tabassum, Glenroy Wason and Lynnell Whichard – who represent the heart and soul of the All Stars. They have made it a priority to build the All Stars – grow their communities and give development to other young people. The All Stars Project is a non-profit organization dedicated to promoting human development through the use of an innovative performance-based model. The ASP creates outside of school, educational and performing arts activities for thousands of poor and minority young people. It sponsors community and experimental theatre, develops leadership training and pursues volunteer initiatives that build and strengthen communities. More info can be found here.